For the first time the TVIL has been divided into North and South Divisions and this has provided the opportunity to hold play-offs between the winners, the runners-up and the third-placed teams of each division. 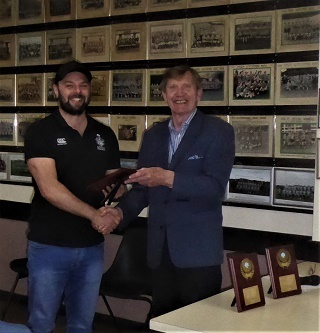 The event was hosted by High Wycombe RUFC at their ground in Kingsmead Road on Saturday 30 March 2019. The first match was between the third placed teams Risborough II and Egham Hollowegians. The Risborough club has only been in existence for ten years and they started off brightly with their forwards showing some pushing power. But they were badly affected when one of their players was injured and the Surrey side began to run through with ease so that the match ended with a score of 87 points to 24. 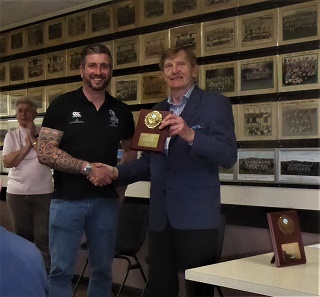 Runners-up Reading Vets and Chinnor are old rivals and their match was much more competitive with the Berkshire side still in contention until the final whistle. They got over the line but could not touch down and Chinnor won by 28 points to 21. In the first half, the play-off between the champions also looked competitive but the hosts High Wycombe Vets eventually won comfortably, beating Rams (formerly Redingensians) V by 43 points to 29. 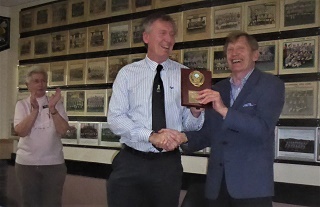 Presenting the plaques to the winners, TVIL President Eric Moyse thanked the host club for their hospitality, the referees for officiating in the spirit of the league and the players for the sporting way in which the matches had been played. He also gave special thanks to TVIL Secretary Terry Brown who had done most of the organisation of the event. Two member clubs have already offered to host the event next season! The Thames Valley Invitation League is composed of local rugby clubs that have men’s lower teams that would struggle to comply with the stricter regulations of the RFU championship. TVIL was the first rugby union competition to introduce unlimited rolling substitution. It also has what may be a unique rule in insisting that when teams turn up short, the more complete team must lend their opponents sufficient players to reduce the differential to no more than one.